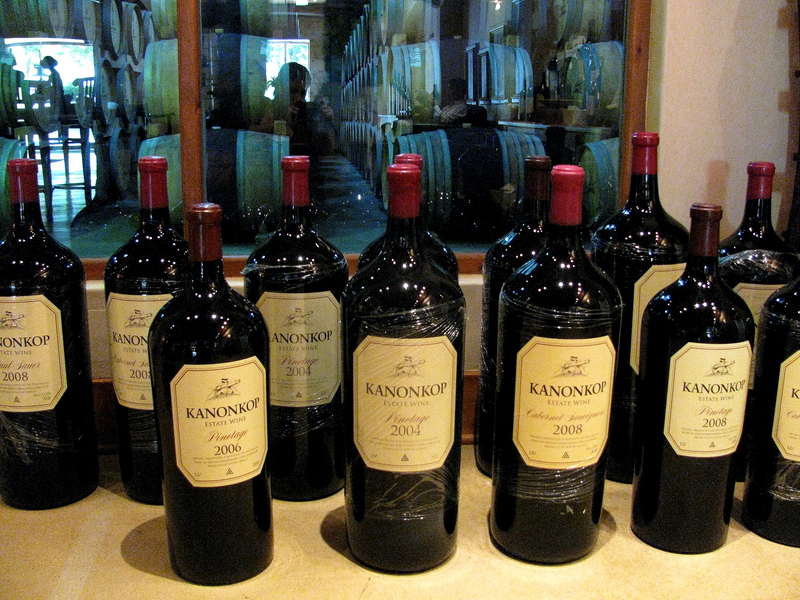 Kanonkop (pronounced ka-NON-kop) is an esteemed wine estate producing only red wines. 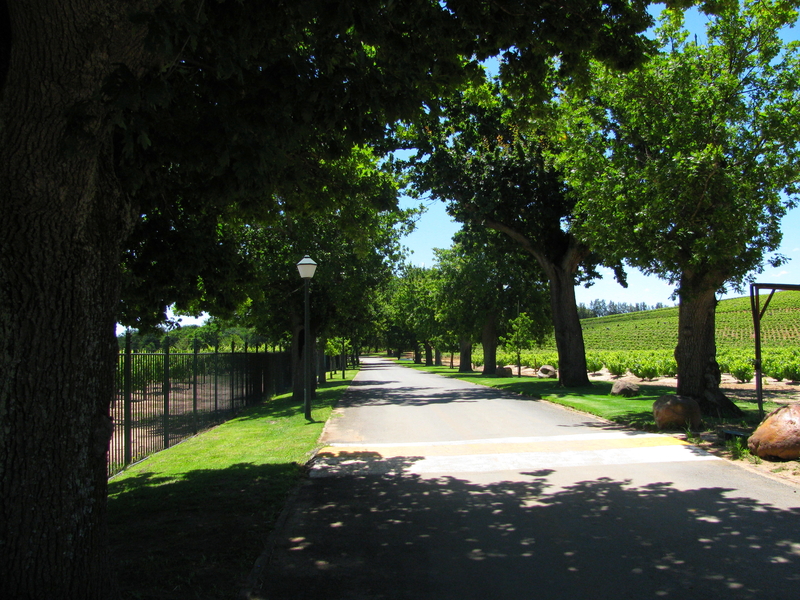 Established in 1910, it is certainly not the oldest wine estate in South Africa (Groot Constantia, est 1685), but it consistently produces some of the very best wines that the country has to offer. 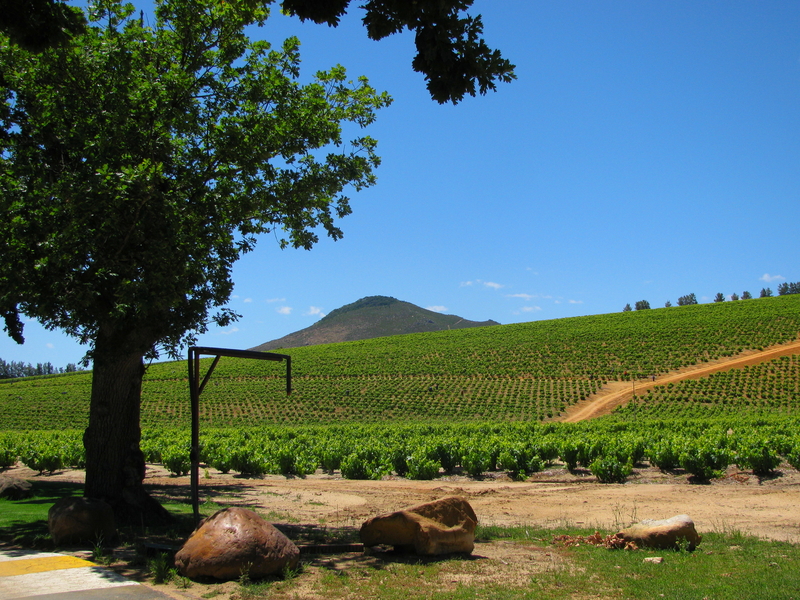 Situated about 50km from Cape Town, it is right at the centre of the beating heart of South African wine production that is the postcard-beautiful town of Stellenbosch. This is a world-renowned wine region and it gets very hot here indeed, often a full ten degrees Celsius warmer than Cape Town itself. I had the pleasure of working in Stellenbosch for two years and I regularly saw the temperature soar above 40°C during the day. Luckily for me, I worked in an air-conditioned office and was able to park my car underground! Having last been there as a young teenager, I visited the estate near to the end of 2011 when I was last on holiday to South Africa. It was a solid 38°C by just before lunchtime and blue skies, terracotta-coloured earth and bright sunshine greeted us upon arrival, as did the old canon at the gates to the estate. We gratefully parked under the shade of some old oak trees and entered the air-conditioned bliss of the tasting room, light classical music playing softly. 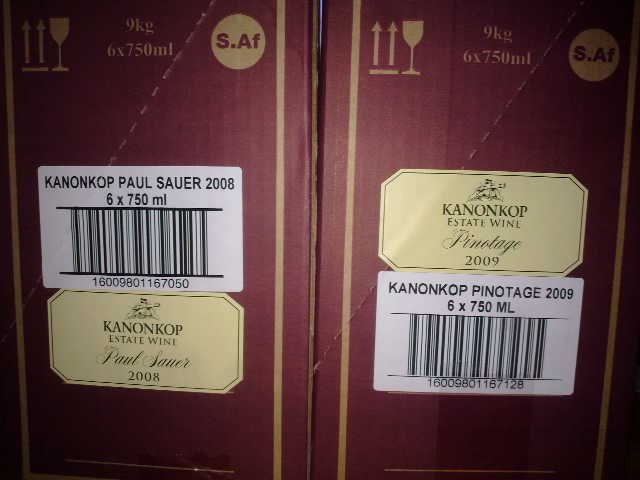 Kanonkop make just six1 wines: The Kadette, Kadette Pinotage Rosé, Pinotage, Cabernet Sauvignon and their flagship wine, the Paul Sauer (Bordeaux blend). Unfortunately for us, they were all sold out of the Cab, which had just received a 5-star John Platter rating, but we were able to taste all the others. The Kadette and Kadette Rosé are their budget-friendly offerings, yet are both well-made and tasty. The red Kadette is, I guess, a Cape Blend, consisting mainly of Pinotage but with proportions of Cab, Merlot and Cab Franc supported by some soft oak. The Kadette Rosé is a lovely dry summer rosé and is a great example of just how versatile the Pinotage grape can be in the right hands. At (from memory) about R70 and R40 a bottle respectively, they both represent great value for money. The Pinotage from Kanonkop is something special. If you’re South African, you will no doubt have had countless bottles of cheap Pinotage and probably haven’t had too many that left you impressed. Well, the Kanonkop pinotage is an exception. It’s a medium to full bodied red wine with amazing elegance and depth of flavour. I tried the 2009 vintage (only two years old) and it was full of luscious dark, gamey flavours and as smooth as silk – so much so that if I didn’t know better, I’d doubt the longevity of this wine. I actually bought a 2001 vintage bottle of this wine while at the estate and drank it at dinner a few days later. It was absolutely terrific. A truly excellent wine and it is easy to see why Kanonkop are renowned for producing some of the very best, if not the best Pinotage in the country (certainly the best I have ever tasted). 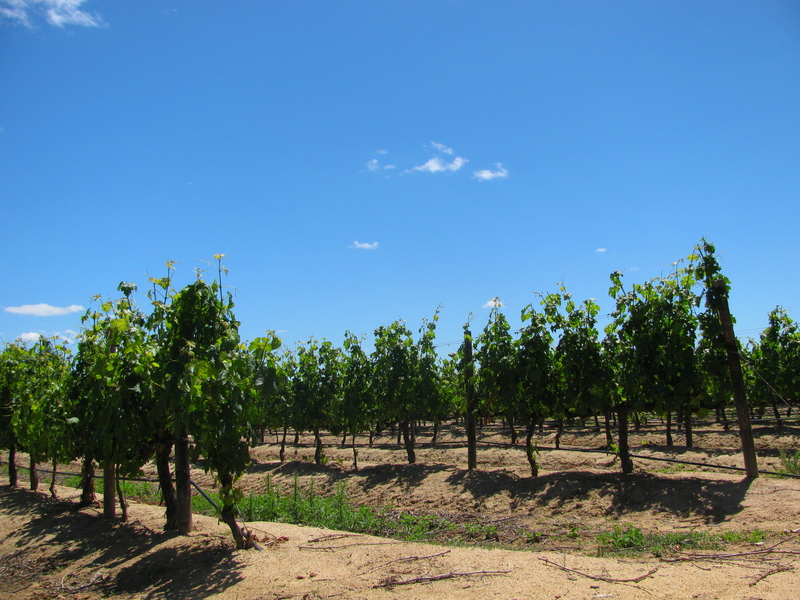 The Paul Sauer is a full-bodied Bordeaux-style red blend and is the flagship wine of the estate. Once tasted, it becomes easy to see why. I was just wondering if it would be possible to top the Pinotage that we’d just tasted when I was poured a small taster glass of the 2008 vintage. I’m no wine expert so forgive my description if you are, but I can remember sweet, clean fruit, soft tannins and soft vanilla oak in such harmonious balance that I’ve only tried a handful of wines previously that can come close, and they were generally 8+ years aged! If I were to open a bottle of my all-time favourite South African wine, Buitenverwachting’s Christine after just three years from vintage, I’d expect it to be taught and out of balance – needing several years to mellow and harmonise into the terrific wine that it becomes when aged. The Paul Sauer has to be one of the very best wines I’ve ever had the pleasure of drinking. How Kanonkop are able to make such age-worthy wines taste so balanced and refined after just a couple of years in the bottle is an absolute mystery to me, but it really speaks to their impeccable quality. I put the question to the charming lady who was pouring our tastings and she did her best to explain to me that the wine must be in balance when it enters the bottle. How they do this, and why seemingly nobody else that I know of manages to do this as well as they do makes me think that there may be a closely guarded winemaking secret in the mix, along with their top quality fruit and stellar winemaker. Their wine was so delicious that I even asked for a small top up when we were tasting (this is a little cheeky, given the general etiquette of wine tasting) and I certainly wasn’t about to spit it out. At R210 and R350 (approx £19 and £33) per bottle, these last two wines can’t be called cheap, although they are certainly not the most expensive wines that I’ve come across in Stellenbosch (cough.. cough.. Waterford Jem, Rust en Vrede 1694, to name a few). To be honest, I almost expected the Paul Sauer to be something of a disappointment given its price tag. However, I left Kanonkop somewhat enlightened and with a newfound respect for what they do. Truly, this is some of the very best wine coming out of South Africa today and it deserves its price. As it was, between us we left the estate with 2x cases of the Rose, 2x cases of the Pinotage and a case of the Paul Sauer. Better make some room in the cellar. 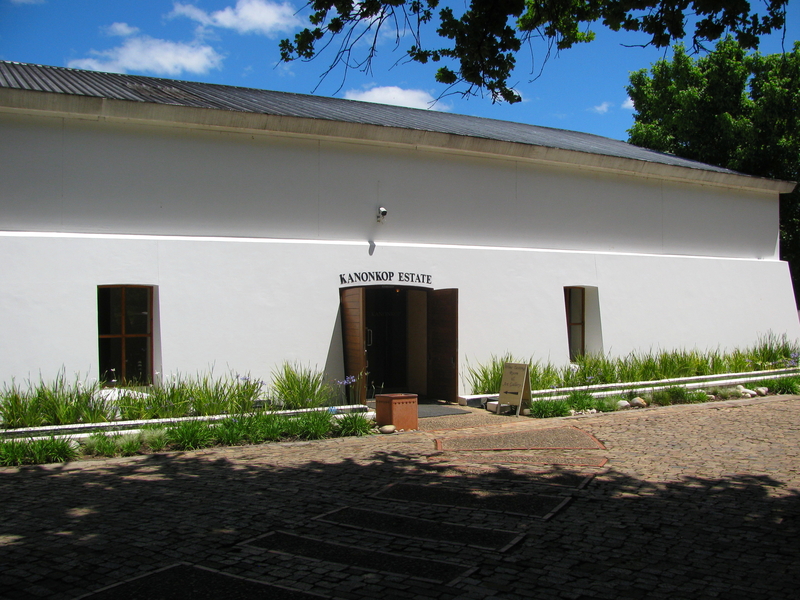 1 Kanonkop also make a black-label Pinotage, made solely from grapes from their very best vineyard and only in exceptional vintages, which retails for approximately R1000 (£90) per bottle. I’ve never had the pleasure of tasting it so I can only imagine just how good this wine must be, but unfortunately it is a little out of my price range.